Hunslet Hawks lost a close match against Doncaster this afternoon (1 May 2016) as they were defeated 22-30 at South Leeds Stadium. Hunslet made up for a poor first half, dominating the third quarter and taking the lead. But Doncaster regrouped and scored twice to seal the win. Mike Kelly opened the scoring after 6 minutes going over for Doncaster, Tom Carr kicked the extras and Doncaster were 0-6 up. Hunslet pulled the score back on 15 minutes when Danny Ansell’s pass put James Duckworth in, but Simon Brown’s kick went wide. Doncaster scored again through Brad Delaney who followed up a grubber kick four minutes later. Tom Carr again kicked the goal to extend Doncaster’s lead to 4-12. Delaney scored a second try on 31 minutes and Carr again converted in the last score of the half. The teams went in at 4-18 to Doncaster. Hunslet came out rejuvenated and Jimmy Watson got them back on the board on 47 minutes. He went over under the posts after George Flanagan and Daniel Williams had been held up as they tried to cross the line. Simon Brown kicked the goal and the Hawks were back in touch at 10-18. Seven minutes later Jake Normington pounced on a mistake when Welham spilled the ball. Norminton’s try was converted by Simon Brown and suddenly it was a two point game and the momentum was with Hunslet. Flanagan and Barnett tried to capitalise but Doncaster’s defence held out, then Simon Brown kicked a penalty from 30m on 60 minutes and the teams were in equal terms at 18-18. A minute later Brown kicked for the corner and Richie Barnett came down with the ball to score and put Hunslet ahead. Brown missed the conversion, but Hunslet led for the first time in the game 22-18. On 67 minutes Jason Tali scored for Doncaster as they, for the first time in the second half, put some plays together and pressurised Hunslet. Tom Carr kicked the conversion and Doncaster were back in front 22-24. Both teams attacked with passion, but it was Doncaster who got the decisive score as Mark Castle scored on 77 minutes, Carr converting once again. Full time score: Hunslet Hawks 22-30 Doncaster. 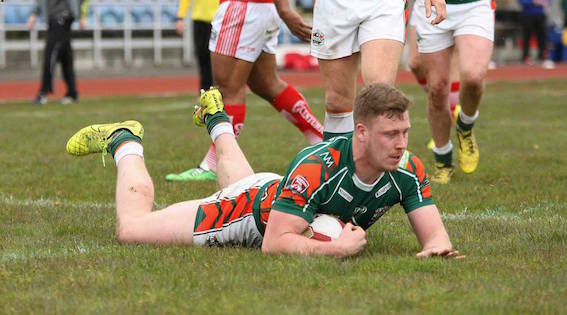 Hunslet remain ninth in League 1 with four points from six matches. Speaking to BBC Radio Leeds after the match, Hunslet Coach Matt Bramald said he was pleased with the second half performance and his job was to make sure the team could play like that for 80 minutes. Over the next two weeks the Hawks will host Hemel (8 May) and then Toulouse (15 May). Hunslet Hawks: Watson, Agoro, Duckworth, Mvududu, Barnett, Brown, Ansell, Haley, Lee, Reed, Crane, Normington, Mackay. Subs: Flanagan, Bell, Carbutt, Williams. Doncaster: Carr, Sheriff, Welham, Tali, Doherty, Howden, Delaney, Aizue, Kesik, Castle, Foster, Kelly, Nicholson. Subs: Wright, Paleaaesina, Scott, Nicholson.